The round table on the issue of the Moroccan Sahara held Wednesday and Thursday in Geneva, at the invitation of the personal envoy of the UN Secretary General for the Sahara, Horst Köhler, officially ended after the UN envoy’s press briefing Thursday afternoon. The UN mediator has invited the participating parties (Morocco, Algeria, Mauritania and Polisario) to a new round table in the first quarter of 2019. “The parties agreed to find a consensual settlement to the conflict,” he said. 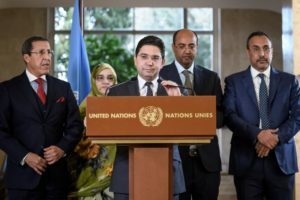 During their meeting on Wednesday and Thursday in Geneva, the four delegations took stock of recent developments in the Sahara issue, discussed regional issues as well as the next steps in the UN-led political settlement process of this territorial dispute. For his part, the Moroccan Minister of Foreign Affairs has described, in a statement to the media covering the meeting, “the positive atmosphere in which this round table took place”. He further assured that Morocco has already agreed to participate in a similar second meeting, provided that it is “well prepared”. According to Mr. Köhler, all delegations “recognized that cooperation and regional integration, not confrontation, were the best way to address the many important challenges the region is facing”. The delegations also agreed that a solution to the Sahara conflict “would be an important contribution to improving the lives of the peoples of the region”.